Baylor vs. Oregon. Notre Dame vs. UConn. We break down why each team could hoist the trophy, what might trip them up, and make our pick to win it all. Will Sabrina Ionescu’s basketball obsession play in Oregon’s favor? Cake, open conversation and an impromptu dance-off helped draw the nation's best class to Dawn Staley. It is Haley Jones Eve -- time to wonder if Dawn Staley has one more trick up her sleeve. The No. 1 class is among the finalists for the No. 1 prospect. Surrounded by friends and family, hats and balloons, high school girls' basketball players across the country take part in the NCAA early signing period. Texas senior guard Lashann Higgs suffered a torn ACL in her left knee during Friday's win over Quinnipiac in the Gulf Coast Showcase. 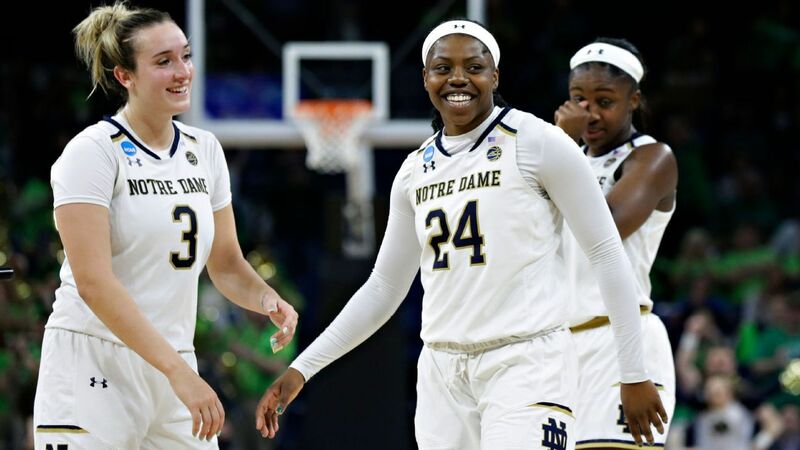 The 6-foot junior guard helped the Fighting Irish rally past Oregon State in their first real test of the season and win the Vancouver Showcase. The Notre Dame guard hit two once-in-a-lifetime shots in last year's NCAA tournament. She shared the songs that get her ready to play. Sue Bird and Megan Rapinoe chat with Sarah Spain on how they met, their careers, LGBT activism in their respective sports and what's next after sports. Can James Wade instill a new culture for Sky? The Chicago Sky have a new coach, a new logo and an almost-new arena. But can James Wade build a winning culture? Is Carter ready to be a 'complete player' for Texas A&M? Chennedy Carter is a high-volume shooter with an unapologetic swagger who has delivered on the big stage. But she must do more than rain buckets. Texas A&M's Chennedy Carter walks us through the 3-pointer that lifted the Aggies over DePaul in the second round of last season's NCAA tournament. When you put your name in the record book at Louisiana Tech, you've really accomplished something. Kierra Anthony had a single-game record 50 points. Asia Durr was WNBA-ready after her sophomore season. But the Louisville senior has blossomed even more as a competitor and person in the past year. Louisville senior Asia Durr says daily meditation and weekly sessions with a counselor have helped her maintain a positive mindset. Stay up-to-date with the latest recruiting news from HoopGurlz.